Our Next Bonanza Bingo is quickly approaching! 3 Jackpots paying $800, $1,000 and $1,199. Don’t forget to set your clocks back an hour this weekend- And you know what that means! It’s time to change those smoke detector batteries again! New alarms that are being sold now have 10 year lithium-ion batteries and so do not need to be changed. 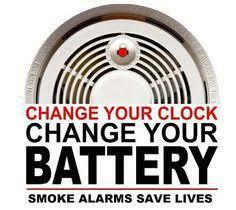 But if you have traditional smoke alarms with 9volt batteries, please change the batteries this weekend! Smoke alarm save lives! Don’t put your family at risk if your smoke alarms have dead batteries. Alarm should also be tested monthly to ensure they are working.